Home > 2015 > 04/29 > What should Peter Chiarelli do with Nikita Nikitin? What should Peter Chiarelli do with Nikita Nikitin? Nikita Nikitin was a veteran defenceman brought in last summer to act as a bridge player, taking on tough minutes while the Edmonton Oilers’ young blue line prospects rounded into form. His first year was a debacle, featuring injuries, questions about conditioning and plenty of poor play. Under Craig MacTavish, the Oilers appeared set to give him a do-over. Will new G.M. Peter Chiarelli feel the same way? Keep him for the final year of his deal. Trade him to another team, possibly retaining salary in the process. Buy him out of the last season of his contract. Before making a decision, the team will want to have a firm read on Nikitin’s value. The defenceman plays in all situations; how has he fared over his NHL career? The first item to get out of the way is the power play. Nikitin ended up a power play quarterback in Edmonton essentially because the team had extremely limited options and he has a cannon from the point. There’s little evidence to suggest he’s any good at the discipline; of the 118 NHL defencemen to have played at least 250 minutes on the power play since 2010-11 Nikitin ranks 101st in points per hour (2.67). He’s in the range of a Trevor Daley or Jason Demers; serviceable if there aren’t other options but not a guy who plays minutes on a team with legitimate weapons. Next is the penalty kill. There is some evidence to suggest that Nikitin has value here. Of the 165 defencemen to play at least 250 minutes shorthanded since 2010, Nikitin ranks 10th overall in unblocked shot attempts/hour. To put that in context, the defencemen we’re looking at might be on the ice for anything from 60 to 90 unblocked shot attempts per hour while shorthanded; with Nikitin on the ice the number is just 64, despite the fact that he’s played for largely middling penalty kills. The picture isn’t quite so rosy in terms of goals against, but even there Nikitin is firmly in the middle of the pack among NHL defencemen. He was above average in both categories this season in Edmonton; this is a role he’s useful in. That leaves the biggest category, even-strength. First, the good points. Nikitin is a pretty good point producer historically; he has scored 0.74 points/hour at evens over his career, which is the same rate as players like Ryan Suter and Andrei Markov. He’s big (6’4”, 217 pounds), and though not overly physical he’s effective as a crease-clearer. However, he has his issues as well. He has a nasty tendency toward glaringly ugly gaffes – giving the puck away or blowing a tire at the worst possible moment. He has somewhat limited mobility and tends to play a conservative game as a result, at times backing off the blue line rather than forcing the issue there. Those issues also mean that when he gets beat he often has trouble recovering; he looks like a pylon more than most defenceman because he gets caught out of the play. His numbers were better than I expected, however. His on-ice shot totals were below the team average, in large part due to a disastrous stint with Justin Schultz, and against that we have to weigh relatively soft zone starts and middling quality of competition; in the aggregate it’s not good but it’s also not the tire fire I was expecting. Then I looked at David Staples’ individual contributions to scoring chances count and found something interesting – in terms of plus/minus, Staples has Nikitin as above average, but it’s because of his work on the offensive side of the game. Defensively, no regular defenceman made more mistakes/minute on scoring chances against. In a bad year, Nikitin’s legitimate contributions on the offensive side of the puck were probably underrated because he was so bad defensively. On balance, I’d be comfortable with him as a third-pairing defenceman at even-strength and a regular penalty killer. The big problem with Nikitin is that if he’s a third-pairing even-strength defenceman/top-unit penalty-killer he should be carrying a modest salary. Instead, he makes $4.5 million per season. What should the Oilers do? There’s an argument to keep him, to burn through the final year of his contract and just get it over with. In this scenario he might even be moveable at the trade deadline; teams are always looking for depth pieces come late February and if the Oilers retained salary they might fetch a low-end draft pick. Alternatively, Edmonton could buy him out, freeing up $3.0 million in cap space this year but taking up $1.5 million in cap space next season. The question really comes down to how close the Oilers are going to be to the salary cap. Assuming that Edmonton can replace those minutes with a $1.5 million free agent, that $3.0 million in cap space the team is saving shrinks down to $1.5 million. If Chiarelli plans to spend that close to the cap, he should absolutely dump Nikitin to make it happen. If he doesn’t, it’s probably worth putting up with Nikitin for 50 more games, adding a low draft pick and wiping the bad contract from the books in one year instead of two. What should Peter Chiarelli do with Justin Schultz? Which Boston Bruins players might the Oilers target this off-season? What will the arrival of Connor McDavid do to the Oilers’ forward lines? Trade him to wherever Scott Howson lands after Chiarelli fires him. But will Tim Hortons need an overpaid d-man? I don’t think we’re going to hear the words “Top Four Defenceman” and “Nikitin” from Chiarelli’s mouth unless there is an “isn’t” in there too. If we can get some Gatorade bottle lids for him consider it a major win. This guy got the biggest payday of his life and showed up to camp out of shape. Buy him out, if anything to send a message that this crap will no longer be tolerated within this organization! The biggest issue with guaranteed contracts. I know it will never happen, but there really should be an out without penalty for guys showing up out of shape. Especially Russians!! Or they could have the same standards no matter what country you were born in. Good Lord, these last two JW articles on Schultz and Nikitin just emphasize how utterly incompetent MacT was as a GM, especially on the defensive side of things. Saddling the team with 8 million dollars worth of dmen that are worth nothing on the open market is grounds enough for dismissal, while the Petry debacle is just icing on a particularly rancid cake. no, it had to be that way. The oilers were all in for McDavid, but couldn’t just do the tank job that Arizona and Buffalo were doing. 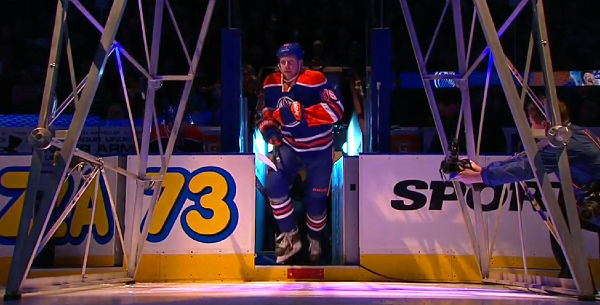 The NHL rewarded Edmonton for not making their tank obvious. It’s hard to believe there was no perceived room to lock down Petry for 3 or 4 years. The Canadiens are on the verge of closing out Ottawa and who is on the ice in the dying minutes? He must have mouthed off too much during the Eakins rein of lunacy. That’s right Ron and we have ONE MORE high draft pick – in fact it’s number one over all and you may have heard of the name CONNOR MCDAVID??? – Well he will be an Oiler next season. So let’s make a deal. Since you are a very smart GM, why don’t you hire the SMARTEST COACH IN THE WORLD (we heard you have interviewed him) and you and DALLAS can have Nikitin FOR FREE! He will do really well under Eakins SWARM – in fact he excelled here in Edmonton! If we have potentially the league’s worst defense and we don’t want him, who would want him? If Chia can trade Nikitin for pretty much anything colour me impressed. That’s just it. Even at 50% retained salary, I’m pretty skeptical he’s tradeable in the here-and-now. If he is, that’s obviously the ideal solution. Well with all the negative toward him I truly hope comes in to camp in ridiculous shape and proves us all wrong. He’s a big strong mobile dman with a heck of a shot and I hope he can find his game again. Mobile??? I don’t think we’ve been watching the same player. Scott Howson was G.M. in Columbus for most of Nikitin’s time there. Mac-T and Howson should have been skidded for this transaction alone. The first priority has to be to keep him from ever lacing up for us again. The second priority has to be to get him off the books as fast as possible. Because of this I think the only solution is to trade him with retained salary (probably a lot of retained salary since we don’t want a bad contract coming back the other way). What happens to both teams if a player is traded with retained salary than the new team buys the player out? Is the new team on the hook for the entire buyout or just the share of the contract. Does the old team only have liability for the year retained or does it too get split over the buyout years? Any one have any clue? Best nikitin situation is LTIR for 82 games. If hockey management was football, the coach would call for a punt. Interesting thought! 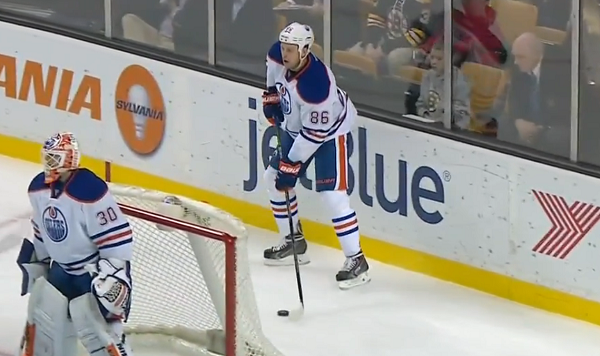 Could McDavid just punt Nikitin. just don’t recover the ball if the other team drops it. To trade him, Chiarelli obviously need compromising pics of a fellow GM. Why can’t you send him to Bakersfield for the entire season. No residuals. His cap space will surely be swallowed up on Seabrook and OEL. Pretty sure you can only bury $950K in the AHL. So $3.55M would still count against the cap if Nikitin is in Bakersfield. Better off buying him out. Under the new CBA I think you only get $900k cap relief when you bury a player. So $3.6MM on the books, plus whatever you have to pay the guy who is filling his role. IIRC it’s $950,000, but this is spot on. My though also. See how he comes to camp, let him compete. I he doesn’t recover his game, waive him and send him down. You recover most of the cap space. Personally I don’t buy him out. That 1.5 million counting against next years cap(if you buy him out) is as big or bigger detriment than the 4.5 counting against this years is, IMO. I shop him all offseason and retain up to 50% of his salary (similar cap savings this year as buying him out, and similar actual dollar costs, but no residual cap penalties next year). Barring that I make moves to ensure that he is playing in the bottom pair at evens, PK and maybe a bit on the PP. I think worst case scenario if we start the season with him we can, as JW states, move him at or near the deadline for late round picks. Who knows, maybe playing the type of minutes he should, and not saddled with Schultz as a partner, he could turn his game around enough to be a tradable asset at the deadline. Trade him and retain half his salary. Free’s up some cash and we get it over with in one year. I suppose a mutual termination so he can go to the KHL would be too much to hope for. I sincerely hope the forensic audit got to the root of this one so they can salt the earth and make sure nothing ever grows there again. Think about it; MacT gave up a 5th round pick for the opportunity to overpay Nikitin before anyone else. I would be shocked if we could get that draft pick back (with or without retaining salary) now. This one is pretty high up on MacT’s list of atrocities for me, and that’s a long list. I believe, that under a real NHL coach(not Eakins), Nikitin will be a decent 3-4 defenseman this year. He is definitely better than Ference. Willis, any you guys planning on doing a recap of the Erie vs Sault St Marie series once it’s finished. Had a chance to watch last nights game and it was quite exciting as an Oilers fan. McDavid is McDavid, no need to say anything else there but I was most impressed with Nurse. He was matched most of the night against McDavid, and while Connor still had 4 assists on the night, I thought Darnell did a great job shutting his line down. I’ll bet $20 that Nikitan get’s bought out, heads to Minnesota, and follows up with a Norris calibre season. I think it’s always been the same problem here with D men… Putting them in situations well above their heads. Our top D players are other teams bottom pairings. I could see Nikitin doing well here if he was pushed down to bottom pair. We could tolerate the fact he’s well overpaid if he became a good 3rd pair guy rather than an awful top pair guy. Outside of that, I’m thinking a trade for retained salary would be a good idea and probably could happen. A buyout strikes me as a very last resort thing as I’d hate to see them lose 1.5 next year too. Plus they have to figure out what to do with Purcell,and a buyout for him also could happen. 3m on the books next year might be hard to swallow. We didnt tolerate smid being an overpaid 4th or 5th D, why would we tolerate a player much worse making significantly more. LTIR, best solution. I dont think anyone would have a tough time believing that he is hurt after watching him play. That’s not too bad an idea. What if he wants to play though? I don’t think the team can force him onto LTIR if he isn’t actually hurt. The CBA may have repercussions for that. If they can get away with it (or if he actually gets hurt this summer) that would be the best-case-scenario. Ideally he would be a fit as 7th dman. Unfortunately, he would have to compete with Ference, Shultz, Marincin, Aulie and Davidson for the job. These last few “what to do with…” articles have made me realize our oilers have a log jam for bottom pairing d. MM, Shultz, NN, Ferance all belong on that pair. Can’t keep all 4 unless one goes back to the ahl. I say buyout NN, and trade the rights to shultz. Use said $ and replace with two of, petry, sekera, franson, erhoff. Would a Nikitin + Schultz for Phaneuf trade work? Maybe… Would we want that trade to work? Nikitin: 1yr @ 4.5M 1st comp; .165 EVP/gm; 2.84 EvGA/60. You do realize Nikitin had better results at even with worse goaltenders. People Pay Dmen a large amount of salary for PP points on units that are often not better than the league average. Never pay for defence PP Points. it’s only one more year. He’s going to be injured for half of it anyway. Not a great signing, but at least it wasnt for long term. We should all be thankful…if Edmonton had committed that money to Petry, we wouldn’t be drafting McDavid, MacT and Lowe would still be in charge, and the team would be going nowhere but backwards. Signing Nikitin for that kind of money actually looks like a stroke of genius to me. The perfectly camouflaged tank job! Everyone on this team made glaringly bad giveaways. I thought Nikitin wasn’t too bad when he wasn’t injured and I think he needs to stay out of the lineup unless he is 100% healthy. If he had a bad back, it is going to limit what he could do and if he tries a pass that jolts the injury, it will affect the result of that pass. People need to get over contracts, the players are who the players are, the amount they make is thanks to their agents (most times) and the stupid GMs. If nobody knew what players made, only where in the lineup they played, there would be much less complaining about people. If I was offered 2 times my worth, I’d still take it. I would love it if he would just go away but I wouldn’t buy him out. 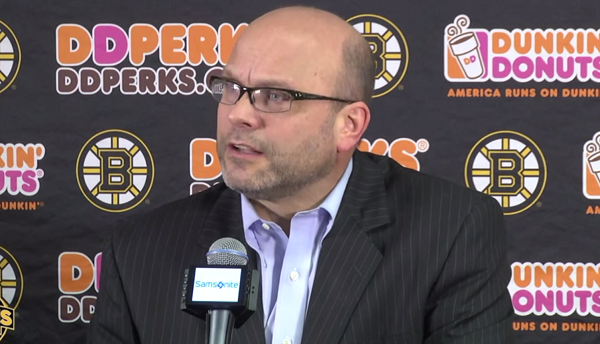 Chiarelli will have better grip on the rosters strengths and weaknesses next summer (2016). It would be better to have no cap penalty then. This years pain for next years gain. The only problem is this team has 3 absolute boat anchors on D. With Nikitin/Ference/Schultz that’s a full 1/2 of the D occupied with AHL defenseman. Couple that with the plan of playing Klefbom/Marincin next year. It’s not acceptable to run another year of horrendous piss poor defence. So 2 out of those 3 need to go. At minimum 1 but if we truly cared about winning 2 would be gone. I think an arguement can be made to keep 1 out of the other 3. I’m of the mind that as long as 2 are out the door and replaced with capable Vet 2nd pairing Dmen.. then I will know they are serious about winning games. Agree the Oilers need to improve the D.
And if Nikitin shows up at camp out of shape and/or doesn’t show real improvement in his play then give him a ticket to Bakerfield. That’s the worse case scenario. By my calculation the difference to the cap between buying him out and AHLing him is minus 550K next year and plus 1.5 mil in 2016-17. Those numbers don’t include a replacement. The team is not realistically a Cup contender in 15-16. I fully expect them to be one in 16-17. I’d want the extra cap room then. All my ideas about what to do with Nikitin seem to include a roll of packing tape, prepaid postage to Siberia and a very large box. Hmmmm.